A father in Marion County, Indiana pleads with Facebook users to share the photo DCS took off Facebook and used it to keep a case open after they failed to find him unfit. The social worker with the Indiana Department of Children’s Services (DCS) agency told the father that the picture was “inappropriate.” DCS has had the child in their custody for the last 15 months. Originally, DCS tried to find the father unfit but failed. They have not returned his child and recently used this picture to keep the case open and the father was told that he had to be watched, even though he has passed all of their tests and they could not find him unfit. Many people commented that hospitals encourage skin-to-skin contact for parent-child bonding. Some parents believe that the state agency has an interest in destroying parent-child bonds to make it easier for them to steal children by reducing and interfering with the child’s attachment to their parent. Then they believe they will have less trouble with the child’s behavior when they separate the child from it’s father or mother. I have verified this with a former worker that I know. The issue here is whether this is abuse. 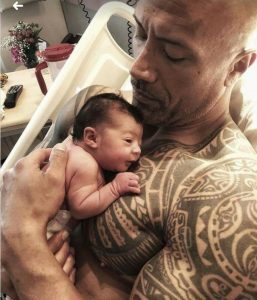 The Rock might have something to say about this since he recently posted a picture of himself with his newborn daughter on his chest. Dwayne the Rock Johnson and girlfriend, Lauren Hashian, welcomed his third daughter, baby Tiana Gia, on April 17, 2018. Hashian posted a video with Baby Tia on her chest stating “You are the most peaceful peanut, our little angel & wow, are we lucky … completely in love,” according to People magazine. The Rock with newborn daughter on his chest. This picture was posted on May 3, 2018. This is a single father engaged to the mom. 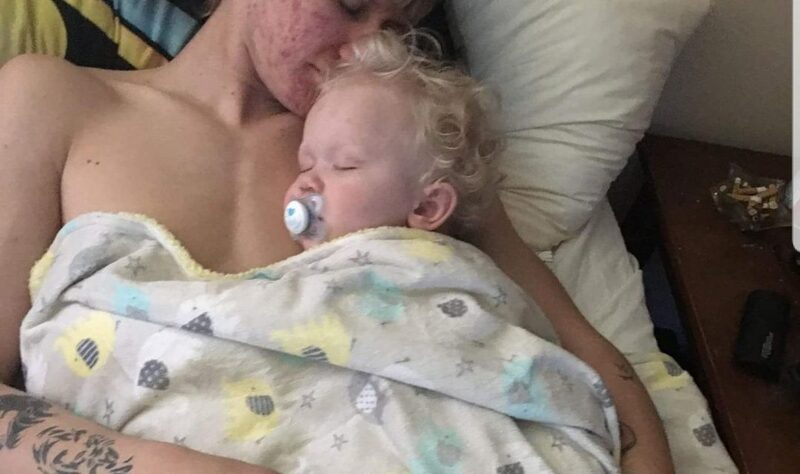 They are young parents posting memories that are important to themselves, that apparently are not favorable to the social worker who has decided to harass this young father. When I spoke with the father he believed that this social worker has made it her mission to take his son. Others have told me that it is perhaps that the child has desirable traits to prospective adoptive parents, blonde hair and blue eyes. It remains a mystery why DHS has decided to pull this picture off Facebook and pick on this father once again. It could be as simple as the worker doesn’t like to lose, or perhaps she was thinking about job security and how much the state makes every time they adopt a child out. Social workers are paid to take children. In order to stay alive, this industry needs other people’s children. The state makes money every time they take a child, terminate parental rights, and adopt the child out. The state receives money from the federal government through Title IV B and Title IV E of the Social Security Act (SSA) which address major components of child welfare. The Child Protective Services (CPS) worker apparently has never heard of parental rights, Troxel, Stanley, or Palmore, and the body of case law that protects a parent’s personal choices from government bias and personal preference. What she believes is in the best interest of this child, the Constitution demands is secondary to the fit parent’s beliefs and values. Despite the protections you are supposed to get for fundamental rights, DPS workers can abuse their power and make life impossible for a parent if they don’t know how to fight back. Young fathers might not know his parental rights and that he has legal rights that attorneys don’t usually tell parents they have. The states have gotten carried away with its parens patriae power and replace the father’s rights with in loco parentis power. This is where the state uses its power to protect a child from a parent they claim is committing child abuse and replaces the natural parent with itself. Essentially, the court becomes the parent and then grants rights to a caretaker. This could even be the other biological parent the court makes the caretaker, but this is all at the court’s mercy. Courts in the past have been known to take a social worker’s word leaving the parent’s at the social worker’s mercy. And in many cases, a social worker fails to get in touch with the cut off father but instead decides that if the mother is a drug addict, the father is one too. This baby boy was in foster care for twelve months before the father was contacted. When the father was notified, he was told that he needed to appear in court over the placement of his child. It is not uncommon for a father to not know what is happening with his child even when the child is being abused or hospitalized. The state of Michigan used to have a “One Parent rule” that got overturned as unconstitutional by the Michigan Supreme Court. Indiana unfortunately is not affected by this ruling however and appears to be practicing gender bias within child protective services. After the father was notified however, the father was forced to undergo a series of tests and qualifications. He had to hire a lawyer and fight to get his child released to him. This took several more months. By the time, the father got his son back he was almost two years old! The social worker used the picture, the subject of this post, to drag this out longer. How this happens is that the state has been able to decide what is child abuse on the fly. The social worker gets to decide what their interpretation of child abuse is, or they outright lie and make up child abuse, and this changes to meet the particular social worker’s bias or prejudice. For instance, remember the story in the New York Post where the father was said to be unfit because he refused to buy him a Happy Meal for dinner, he told his child “dinner anywhere other than McDonald’s — or no dinner”. Because the father said “no dinner” he was considered unfit, lost custody, was put on supervised visitation, after a psychiatrist, Marilyn Schiller, filed a report telling a Manhattan judge deciding the custody battle, that the father was “wholly incapable of taking care of his son” and should be denied his weekend visitation. An amicus (a person who serves a role like a social worker with the added bonus of immunity). The state uses its power to interfere with fundamental parental rights and claims that it was necessary to protect the child from abuse and supposedly in the child’s best interest. The problem is the state had to abuse its power to remove a child from a fit parent. They had to skip over the steps and tests the Constitution demands before the court is allowed to interfere with fundamental rights. The worker or the judge turns perfectly legal activity and behaviors into excuses for their intervention, all supposedly protecting the health and welfare of the child. The parent and child’s constitutional rights were violated but the parent is unlikely to find any attorney who will argue that especially if the two parents do not agree with each other. 1. He and the mother were not married. 2. The parents are young. 3. The father or mother does not have much money. 4. One of the parents is found unfit. Many children are placed into foster care when one parent is under investigation and the parents are not together. CPS is notorious for not informing the other parent when a child has been taken into their care. This was the case here. This father’s son was taken from the mother and placed into foster care. This child was in foster care for an entire year before the father was notified. “The Error is the Intervention,” Molly Tierney says after realizing that foster care is bad for children and have served only to dismantle families. Children don’t learn who to trust and who to love. Even if this father wins, he will have spent tremendous hours of either his own time fighting CPS pro se, losing precious time with his child, and spending thousands of dollars with attorneys. This father will be fighting massively funded state machinery. Hopefully this parent does not sign any safety plans and tells this social worker to stay out of his business and to go away. That’s a very scary thing to do when they take something as tender and innocent as the picture the subject of this blog and tries to twist and use it. It can be very expensive if he has to defend himself in court and many parents lose their child, not because of child abuse, but because the father cannot afford legal representation. Some states have passed laws regarding when DFS can require a parent to sign a safety plan or risk service plan. Child risk safety plans were ruled unconstitutional by a federal court in Iowa. See the Iowa Department of Human Services (DHS) ruling here. The Department of Health and Human Services is who manages the Social Security Act. If your state is allowing its state agents to engage in harassment of you and your child become a member here to learn how to effectively stand up to them and end the abuse and protect your child from greedy government employees who have gotten their head twisted up regarding who protects the child. Parenthood is one of the most precious things in life. You can find examples of a parent’s love for their children all over the internet, in Hollywood movies, on Netflix, Hulu, Facebook Live, and in everyday life. It is worth protecting your parent-child bond. It is sad that you need to, but it is a fact of life that these government workers will take your child in a flash if they think they can trick you out of your rights. They will have you so stressed out of your mind that you will be willing to make just about any deal to get them back. They will make you jump through hoops and delay returning your child so that they can sever your bond and then farm the child out to a foster home and then terminate your rights to clear the path for adoption. Whether you have a boy or a girl does not change how deep your love goes for your child. The gender of the child makes no difference to most parents. They would give their life for their child and do just about anything for them. And even though Rock states that he cannot seem to make a boy, regardless, he expresses the same deep love for all three of his children. In The Rock’s own words from his Instagram page, he says, “And to my third and youngest daughter, Tiana Gia – like I did when your two older sisters Simone Alexandra and Jasmine Lia were born, you have my word, I’ll love, protect, guide and make ya laugh for the rest of my life.” Parents have become easy prey for CPS social workers because of your love for your child. Title IV E claims the focus is on providing safe and stable out-of-home care for children who are in out-of-home care due to child maltreatment or other circumstances until they are able to achieve permanency in their placement by being safely returned home, placed permanently with adoptive families, or placed in other planned arrangements. Many parents are placed in this position because their idea of how to raise their child differs from a government employee’s idea of how to raise your child. I personally got in contact with this father and verified his story. Government employees force parents into a fight over the best interest of the child based on nothing more than one individual’s idea and biases used to interfere with your legal right to decide what is in the best interest of your child. These practices will continue until parents wise up and learn their rights long before they find themselves in this stressful position. Once you are facing your child being stripped out of your life, you will have so much anxiety that could lead to PTSD and it will be much more difficult for you to learn these rights. And have no doubt you will have to learn them, your attorney is not going to know this as much as you will need. And just as you manage your health before you go see a doctor, you try to figure out what is ailing you, what the illness is or what is making you sick, you try to identify the disease and learn as much as you can about it. You should be doing the same with your rights. If you need a jump start on this. We do have information, research, and examples in the context of child custody trials and hearings to help you absorb and learn how the Constitutional protects you from the invasion of the state whether it be from a judge, from a social worker, the other parent, grandparents, or other third parties. We make it easy to understand your rights and put your rights to work protecting your child, and keep your family from being fractured by these state actors. Monica Szymonik in Connecticut brought our attention to this picture. She asked her Facebook followers if they thought this was gender discrimination when mother’s put their children on their chest to breastfeed. Parents and their children need protection from government over reach. This includes protecting the planning that goes into having a child and raising your child and how you choose to raise your child. If you want more information on how the constitution protects your legal choices and interested in keeping your choices legal, you can get in touch with Sherry Palmer, here. UPDATE: On January 14, 2019, I spoke with this father. His child was returned to him about a month and a half ago after about a year and a half in foster care. They had removed his son from the mother when the child was 3 months old and waited almost 12 months before they contacted the father. This is a problem we hear about a lot. The father is no longer the subject of the CPS investigation. He has been cleared. He was able to get an attorney to help him with his case. The case was originally opened because the mother was using drugs. The father has never used drugs and went through numerous tests to prove this because of the mother’s drug use. The social worker who tried to use the picture against him was removed from the case. Monica Szymonik, Mom’s Unshackled Connecticut. This picture was brought to our attention by Monica Szymonik. PreviousWhat are the legal rights of separated parents in Kentucky? Does the Family Law System require and encourage false abuse allegations?